The competition takes place in the Höhlenstein valley, which connects Toblach with Cortina d’Ampezzo and Auronzo di Cadore. The valley is located between the Dolomites of Sexten (to the east) and the Dolomites of Prags (to the west). Most of the sections are located around the Landro lake. 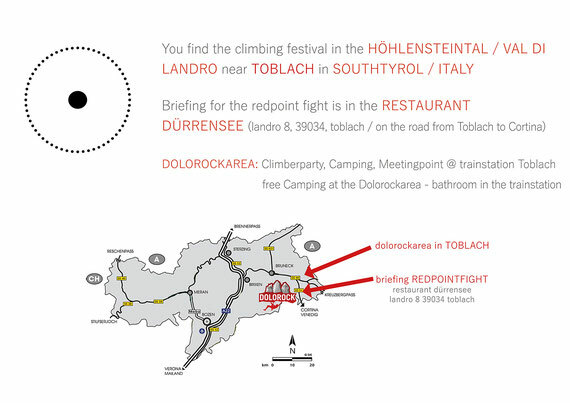 The Dolorock arena is located in Toblach between the train station and the Grand Hotel. This is where the award ceremony and the legendary Dolorock party, with raffle and zlagboard contest, take place. Due to the spatial requirements of this year's Drive-In Cinema event, it will take place at the grounds of the Nordic Arena in Dobbiaco.